There’s no doubt that gold has been an incredible investment throughout the year 2016. Since January first, the price of the precious metal has already gained by around 18%. Now the big question is, “Will gold remain as a strong investment throughout the rest of the year? In my opinion, the answer is yes. Today, we’ll talk about why. Market Conditions – As a safe haven investment, gold will move against the market. This means that when stock market conditions are overwhelmingly positive, we will likely see declines in gold. Adversely, when market conditions are negative, we will generally see gains in gold. This is because when negative market conditions hit, investors look to gold as a way to keep their money as safe as possible. This increases demand and causes gains. On the other hand, when market conditions are positive, investors tend to sell gold in order to have more money available to take advantage of growth in the market. Economic Conditions – Global economic conditions also play a major role in the demand associated with gold. As a safe haven investment, when economic conditions are negative, investors tend to look toward gold once again, to keep their money safe. After all, when economic conditions are negative, the values of currencies decline. However, when economic conditions are positive, we tend to see less by way of demand for gold. The USD – Because gold is priced using the USD, there is a strong negative correlation between the two. When we see gains in the value of the USD, we tend to see declines in gold. That’s because when the USD is high compared to other currencies, the cost of gold in nations outside of the United States rises, leading to less demand. Adversely, when the USD is declining, we see gains in gold as the cost of the precious metal becomes lower around the world, leading to increased demand. Market Conditions – After the market fell in January, we’ve seen a bit of an incredible recovery. The only problem is that we are seeing the same bubbles, and global economic conditions simply don’t support this growth. As a result, the market is a concerning place to say the least; and this will likely cause gains in the value of gold. Economic Conditions – When we look at economic conditions around the world, we’re seeing more of the same. Europe, China, Japan, Venezuela and more than 20 other economies continue to walk the tight rope above financial disaster. In the United States, things seem to be going sour as US jobs have fallen to 160,000 jobs added in April. All in all, things aren’t looking great for global economic conditions, but for gold, they are incredible! USD – Throughout the rest of the year, I’m also expecting for the USD to support price growth. So far, economic conditions have been slowing, and that’s stopping the Fed from increasing interest rates. All in all, it looks like the USD is going to feel some pain throughout the year, which will also lead to higher demand for gold. As you can see, demand is likely to climb throughout the year 2016. This coupled with the fact that gold has reached peak supply, meaning production is likely to fall, will lead to more big gains in the commodity throughout the year. Where do you think gold is headed moving forward and why? Let us know your opinion in the comments below! 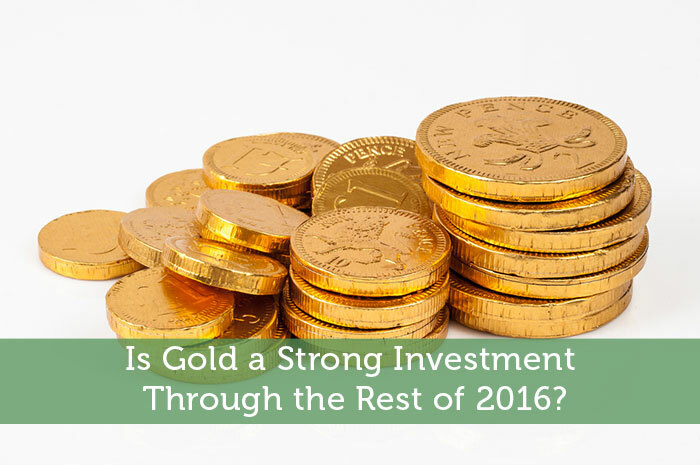 Is Gold a Strong Investment Through the Rest of 2016? Great article! Gold has been in a moderate uptrend since the beginning of the year leaving the path of least resistance higher as there is a solid band of support in the mid $1200’s on the charts. I think that Gold will enter a new bullish market right after it breaks the $1,300 mark, though it tested this point a week ago. This week or next it will definately break it and make it a pivot point. Just my 2 cents! The demand of gold has drastically reduced and if I consider the price trend of gold in India or globally it is quite fluctuating and following a range. Thanks for thi wonderful guide about gold investment.